Nurse Tanna Walker tells Steve and Sarah Schroeder that she has "chills" seeing him "happy and healthy." Last she saw him, he was just starting a long recovery after a near-fatal helicopter accident at Fort Campbell. Their son, Luke, sits in his lap. About a year ago, Fort Campbell helicopter pilot Steve Shroeder was hovering around West End in his Black Hawk, practicing approaches to Vanderbilt Medical Center's helipad — just in case he ever had to deliver a patient to the hospital's trauma center. Two weeks later, he was in the back of a LifeFlight air ambulance making that same landing, clinging to life after a training accident on post. For the holidays, he returned to visit with the nurses and doctors who cared for him at his worst. The 17-year Army veteran was invited with a handful of other patients who narrowly escaped death in Vanderbilt's surgical intensive care unit. But he doesn’t want to be called a success story just yet. "Don't I have to be a success, first?" Schroeder asked his wife, Sarah. "I don't think he understood at the time that the fact that he was still here was a success," she says. Schroeder's helicopter went down at Fort Campbell during a training exercise at the end of January. He'd just dropped off a team of soldiers when his UH-60 started vibrating so violently that he knew in an instant he was going down. "Next thing I know, everything was black, and I was upside down," he says. Of the four injured, Schroeder was hurt the worst. He had a spinal fracture and broken neck, ribs, arm and foot. His lungs were bruised, and he suffered a brain injury. The wreck burned his torso and lacerated his liver. Somewhere along the way he sprained his ankle. And while he's in great shape a year later — by comparison — he's frustrated that his waist-down paralysis hasn't improved. Chief warrant officer Steve Schroeder currently serves in the 101st Airborne's Warrior Transition Unit. He says it's unlikely he will ever fly helicopters again in the Army. "They give you a time window when most people get stuff back, and we're still in that time window, so we're just going to push forward with as much rehab as we can and see what comes back and be thankful for that," he says. Because of all the drugs he was on, Schroeder remembers almost nothing from the hospital except the hallucinations. He was in such rough shape, his four kids weren’t allowed to see him for two weeks. 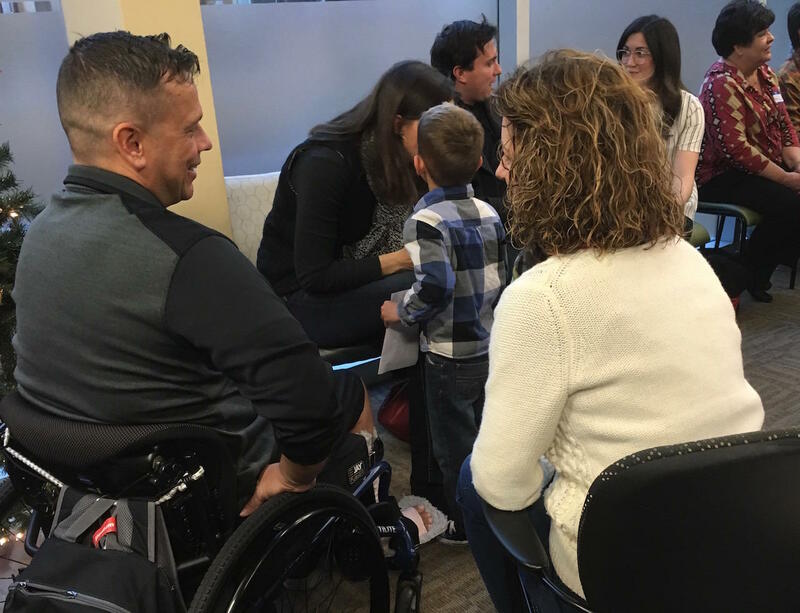 Their youngest — 4-year-old Luke — sits on Steve's lap in his wheelchair as they greet the nurses and doctors who cared for him. "I remember Luke coming up to see you for the first time and it was a very sweet moment," ICU nurse Tanna Walker tells the Schroeders. In the surgical ICU, nurses are often one-on-one with patients. But even when patients successfully recover, the medical staff may never know. "It's hard to see someone with that many drips going and that many surgeries back and forth, back and forth, and never really awake to see you but you feel like you know them," Walker says. "Whenever they leave, they're going to a rehab facility, typically, not going home. You hope for the best, and you get another one." So Vanderbilt is trying to bring some back more often. For Walker, Schroeder stuck out. And as he begins to address the medical staff that has gathered in a small conference room, Walker begins wiping away tears. "I’m a chief warrant officer with the 101st [Airborne Division]," he says. Schroeder has flown in Iraq and Afghanistan. He acknowledges that he had a dangerous job and knew that he could die. "I've had a number of friends killed," he says, his lip beginning to quiver. Schroeder composes himself, looking at the back wall where a projector screen shows photos of his time at the ICU. He recalls his comrades killed in action. "They didn't have a chance to say anything more to their wives, or their wives back to them," he says. "That means the world to me, to have that one more day." Vanderbilt Medical Center has been inviting back patients who nearly died in the hospital's trauma center to meet with the doctors and nurses who helped save their life. 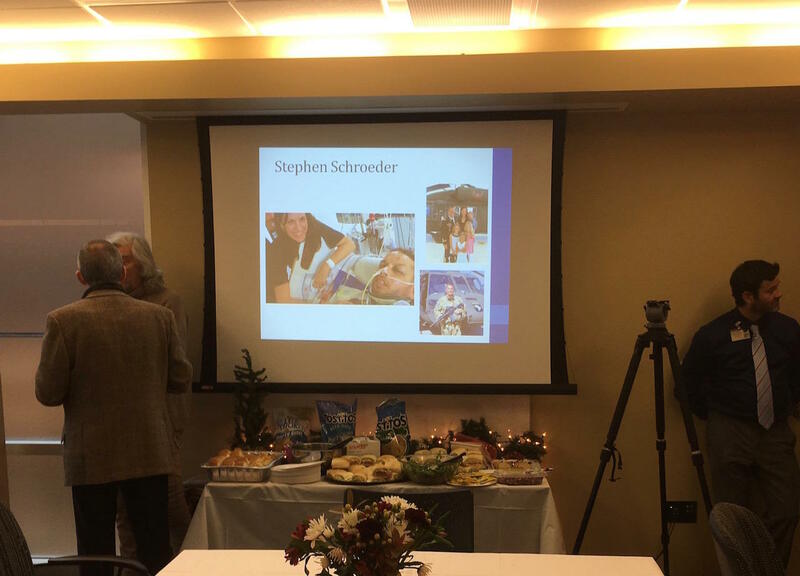 At an event during the holidays, the Schroeders were one of five families to come talk about their experience. Plumbing, electrical and HVAC repair companies are beginning to see the military as a prime talent pool. Handyman services have had a tough time recruiting in recent years, especially as the job market improves. Perhaps none have turned their attention to former service members like Nashville's Hiller Plumbing, which has made Fort Campbell into almost a sole source of manpower. Fort Campbell would dearly love to see some of the $54 billion in defense funding that President Trump has proposed. The commanding general of 101st Airborne says that the Army post could use more soldiers, as well as long-awaited updates on buildings. The Army is replacing its standard issue handgun with a new model, and some Fort Campbell soldiers are the first to receive the sidearm. More than 1,300 soldiers from the 3rd Brigade Combat Team, who were deployed last year to Afghanistan, are now back at Fort Campbell. The last troops arrived over the weekend.